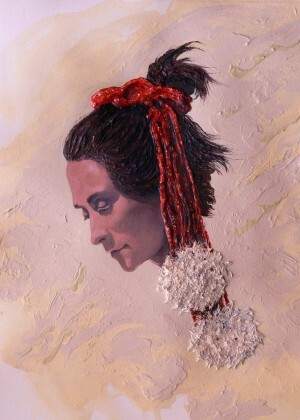 SMITHERMAN believes that a portrait must be more than a well drafted likeness of the subject. Establishing a rapport with the subject is critical, and finding that inner essence of personality and transferring it to the portrait is the most important part of his artistic approach. Often, the finished work evokes not only the inner qualities of the subject, but reflects the relationship between the subject and artist, giving a dynamic to the finished work that cannot be found in photographic portraiture. Working in acrylic on archival hand-made arches paper, SMITHERMAN uses a subjective style in a contemporary mode to capture the character of his subject with engaging complexity and dimension. His palette has brilliance and his technique yields an unprecedented subtly of depth and texture. SMITHERMAN begins his relationship with the subject in a half-day photo session. During the session he normally takes hundreds of shots in an outdoor setting. For more information including pricing email the artist at larry@larrysmitherman.com or call 512-452-5025.